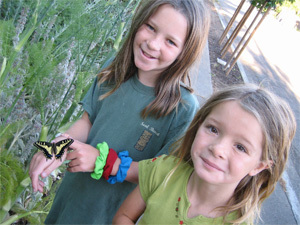 Ellie found Stella, a bright green caterpillar, munching on a fennel plant a few weeks ago. She captured her and placed her in Hermione's old cage, feeding her fresh fennel daily and cleaning out the astounding production of caterpillar poop she left behind. 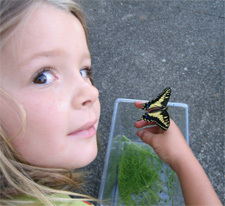 We left Stella (and another one we'd found, Little Jack) with Monica when we went down south and when we came back Stella was hanging in her cocoon. In the 2 weeks she laid in there, she transformed mysteriously (as did Little Jack, whoses ceaseless munching on fennel turned him into Huge Jack) and this morning she emerged. 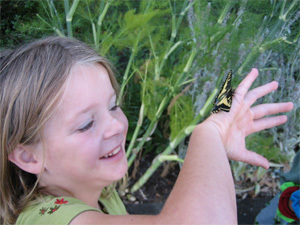 Ellie let her out, and while she dried her wings she crawled gently on Ellie and Em's bare arms. 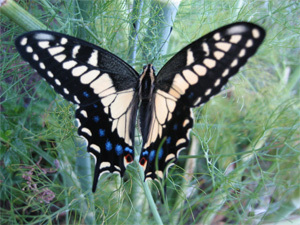 Eventually, her wings dry, she fluttered off, a beautiful tiger swallow-tailed butterfly.